A new analysis of government investment in research by Scienceogram for Science is Vital has found that UK investment in publicly funded research fell to less than 0.5% of GDP 2012. Not only does the decline in investment put us at the bottom of the G8 group of countries, but it’s less than any G8 country has invested in R&D in the last 20 years. 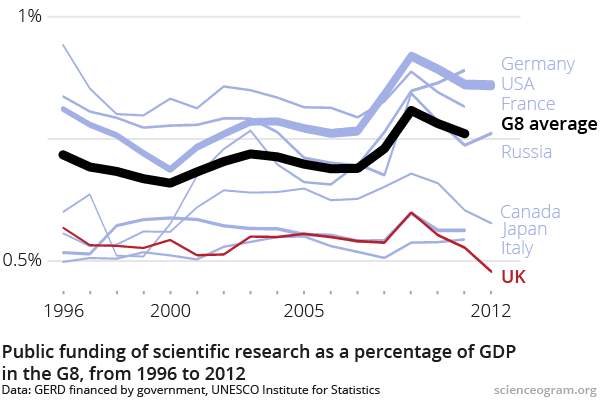 This graph shows investment in research across the G8 since 1996, and is a stark illustration of the UK’s lacklustre international performance when it comes to investing in science. Having ranked near the bottom of the pack throughout, the decline since 2009 has taken the UK to unprecedented lows. This is the result of the steady erosion of the science budget by inflation after being frozen in cash terms in 2010, cuts in capital expenditure, and significant reductions in departmental spending on research. The release of these figures coincides with the launch of Tell Them Science is Vital. Campaign group Science is Vital is asking supporters of science to contact their MPs and parliamentary candidates to let them know how important science is to them and their community. With a General Election looming and during British Science Week, this is a great time to make your voice heard. Visit bit.ly/tellthemSiV to spread the word and get involved! Our graphic shows governmental spending on research by G8 members since 1996 as a percentage of gross domestic product (GDP), which is a measure of a country’s total economic output. The thickness of the lines represents the country’s GDP, in order to illustrate how different countries affect the average: a country with a larger GDP will influence it more (which is why the average tends to track movements in US research spending). Germany, France, Italy and Japan haven’t reported figures for 2012 yet, which is why their lines, and the line for the overall G8 average, stop at 2011. Figures used were obtained from the UNESCO Institute for Statistics. We used two figures, Gross Expenditure on Research and Development (GERD) financed by government and GDP, both in current $PPP. Purchasing power parity (PPP) is a correction applied to adjust for price differences between countries and across time, and is the simplest way to make the figures internationally comparable. Technically, Russia was only a member of the G8 from 1998 until its recent suspension in 2014. However, that only affects the first two years of this graph so we’ve included Russia throughout for clarity. Also, while the EU is a bloc member of the G8, it is not included in this analysis. Finally, Italy did not report the breakdown of GERD by source of funds for the years 1997–2004, so we linearly interpolated between the 1996 and 2005 values. This shouldn’t significantly alter the results. If you’re interested in the full details, you can check out this spreadsheet of the data we used.